Stratus - LifeLearn Inc. : LifeLearn Inc.
To stay competitive and profitable, sales teams need to perform efficiently. Without a simple, efficient and centralized way to manage clinic presentations, lunch and learns, and sales promotions, important opportunities can fall apart when sales teams have to spend more time searching for the latest material. LifeLearn Stratus was designed to empower sales teams and optimize their performance as a simple, centralized and efficient way for organizations to better deploy, manage and elevate the effectiveness of their campaigns and sales presentations online. As the culmination of LifeLearn’s deep knowledge of both the science and business of the animal health industry, Stratus increases the efficiency of sales teams anywhere as a cloud-based presentation and communication system that provides sales managers with key analytics to measure the performance of teams and identify areas for improvement. To ensure brand and message consistency, Stratus allows standard content to be changed and sent to sales teams, who can then utilize presentation content anywhere through Stratus Mobile. Clients have individual needs, and how you respond to them can make the difference between closing a sale or losing an opportunity. To ensure optimal outcomes, Stratus provides an extensive range of features for sales teams. Sales reps can customize presentations on the fly according to client needs while maintaining industry and brand compliance. Stratus has sophisticated sharing functionality that allows you to easily share presentations with non-Stratus users while setting the presentation visibility for each recipient. Online/offline analytics to accurately measure the performance of remote teams. Content management tool: Lockdown specific content for accuracy and consistency with your team. Unified message platform: Mitigate compliance and branding risks with a unified message across all sales material and the ability to lock content for legal compliance. Easy-to-understand analytics: Clear yet detailed analytics from sales presentation activity to make informed strategic decisions. 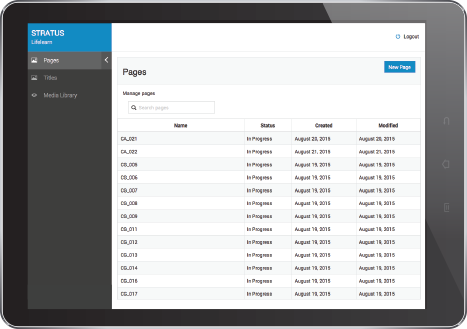 Sync the latest content: The cloud-based Stratus platform – with user-control access – ensures the most current and accurate information can be displayed and downloaded anywhere at any time. Safety and security: Stratus is extremely secure and does not allow other companies to see your organization’s material or analytics. Stay productive anywhere: Build presentations at any time, even when not connected. According to research by the Sales Management Association, sales teams that use sales-enablement systems like Stratus perform 11% better than teams who don’t. According to research by Aberdeen, using sales-enablement systems like Stratus can boost sales revenue by up to 13%. According to Forbes, 59% of companies using sales-enablement systems surpassed revenue targets, and 72% of those companies exceeded revenue targets by 25%. LifeLearn’s industry knowledge and experience allows us to specialize in building content by a team of Biomedical Communicators. Accredited in the visual communication of bio-science, medicine and health, our team of Biomedical Communicators specializes in simplifying complex scientific information and delivering high-quality, engaging and memorable content. Stratus comes fully supported with a step-by-step user guide and quick how-to videos, plus on-call support through LifeLearn. Discover today how you can easily improve the effectiveness of your sales campaigns. For your free Stratus demonstration, contact [email protected] or call 1-888-770-2218.